We’re gonna go ahead and dive right in!! They say “Maybe I’m gonna go for weight loss”. They type something in here like WEIGHT LOSS. They HIT ENTER to do a search or get started…. Then it’s gonna come up with various different keywords that are out there and they’re gonna see for stuff like weight loss. It’s gonna be anywhere from a $1.84 per click to $5 per click. VERY VERY EXPENSIVE! This is something that we really can’t get into unless we have a product that’s paying us like $300 or more. It’s easy to see why people get frustrated, especially when you look at the fact that most products on Clickbank and affiliate offers only pay $27 to $24 even $35 for tea at the highest per sale. That means that you would have to get a sale at $5 a click, every 8 clicks. That’s like a 15% conversion rate which is DAMN NEAR IMPOSSIBLE! I can see why you’d be frustrated trying to make money online. If you’re gonna try to go the Free Traffic Route, You’re gonna see that for weight loss, there’s a lot of competition. You can see here that we have over 2.5 billion web pages competing. There’s no real way to compete for something like this. Internet marketing is a little too complicated… It’s too crowded… How do we get involved in this? One thing you need to remember is that, as a marketer, my job, first and foremost, is to market things that make me money; not things that I think are cute or fun. I will sell good things that the market says they want! If your market doesn’t say they want them then you’re not gonna make any money because they don’t want it but a lot of people miss out on this fact. Now, I want you to notice that this trigger word list has nothing to do with any market. We don’t know if they have a leaking faucet, or a leaking air conditioner or if their radiator is leaking. We have no idea. So we type this into the Google Adwords Keyword Tool like this and then we get our results. Now, notice how compared with the weight loss stuff, there’s actually a lot more words here with low competition. We can actually go here and look at something like a leaking roof which might look like it’s pretty competitive but it’s actually not! 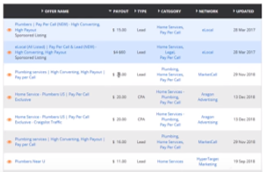 We could look at something like a leaking showerhead – low competition; It’s $4 per click! But we’re actually gonna go to google and we’re gonna see if there’s any advertisers there. If there’s no advertisers, it’s probably gonna be a lot cheaper. Not a whole lot of competition here! This is something that we could probably get into relatively inexpensively. If you need a way to make money teaching people how to fix their leaky shower heads, YOU CAN ACTUALLY GET REFERRALS TO PLUMBERS. If you were to go here on offer vault and look for plumbers, you can see that these guys are paying by the phone call and by the lead! That means that this guy is gonna pay you $28, not for a sale, not for someone to whip out the credit card and buy something, but for a phone call! That’s right! All they have to do is call a phone number for a specified amount of time, usually between 90 and 180 seconds and BOOM! You get $25! Just like that! Just think of how easy it would be to set up a site about all the things that could be leaking in your house. You setup the site – You get some cheap traffic – and BOOM!! You Sell Leads To The Plumbers. Through the affiliate networks, it’s actually pretty easy and it’s all automatic! All I do is advertise the phone number that the affiliate network gives me and I get paid every time someone calls! When we type in the word “LEAKING”, it gives us related terms to try. This shows us various terms that are related to the term we typed in. For leaking, it says plumber, roof, water heater, water, roof repair, toilet, hot water, heater. This is important because these are Showing Us What Google Thinks Is Relevant Based On Other Searches. You can see a lot of them are Based On The Stuff People Are Searching For. Now this is based on a concept that used to be in google called the Key Word Cluster Tool/Google Wonder Wheel. It would show you related words related to the term you’re looking at. This gets really good when you need to find affiliate offers and subcategory keywords. You Can Even Isolate These By Competition! If i want to isolate these by competition, I can just go over here to competition. Type in LOW, HIT APPLY and BOOM! I’m only gonna get words that have low competition! This is your Golden Ticket into cheap easy-to-tap niche markets. You always want to focus on giving the customer good value so if you have a site about leaking showerheads, make sure you give them a good value and then tell them why they would need a plumber. If you have a site about leaking shower heads…. Figure Out What These People Want. You could see right at a glance that you got a lot of pregnancy words. This would be perfect for pregnancy books, courses on parenting, all kinds of stuff like that because if you know someone’s gonna have a baby, you know that babies are kind of expensive. So we can actually see that we can get involved in this and we can help people get the answers they need and lead them to stuff that’s going to make us money. A lot of stuff going on, you can get paid big time! Just For Generating Leads For Health Insurance which is crazy! You’ll notice that if we use the word printable here like this, sometimes the results are gonna be kind of limited. There’s not a whole lot here. What I like to do in this case is that I like to use the tool on the Free Toolbar. 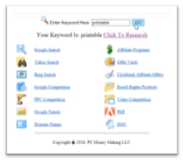 If you were to go to the free toolbar that we have over at AffiliateMarketingDude.com, You’re gonna get the keyword research tool and you can put the word “printable” in. 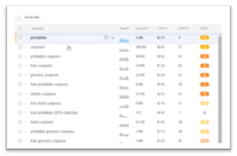 This is going to give you a little bit more data about your keywords so that you can use them to find other niche markets. When you find something that looks good, it’s best to take this and put it over into your Google Keyword Planner. If we find something like “printable coupons” and we go to our google keyword planner like this and isolate the word “printable coupons” and Hit GetResults. What I like about this new “Related terms to try” is the fact that we can actually click on these terms! For example, I can use those words and type something in like “promo”. We can see what people want. There’s also different things like coupon toolbars, money saving toolbars, So we could see that this stuff works really well! So that you can see how to use this! You want to choose where you want to be. If you’re only advertising in the United States, then you’ll want to type in USA. It’s gonna isolate the results just for the USA. It should drop the numbers a little bit, then we can go in and see what’s going on there. 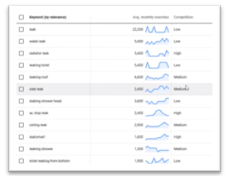 Average Monthly Searches is how many times a month the term is searched. This gives you an overview. Competition is just for paid search. This has nothing to do with organic free search engine rankings or SEO. Top Of Page Bid means that to be on the top of everyone that’s usually what it’s gonna be. I like to start on the low range. I always like to start low to see what’s out there and to see if i can get traffic because 9 times out of 10, I usually can. That’s basically how it works! THAT’S THE GOOGLE ADWORDS TOOL!! Find Yourself Some Niches! I got some cool stuff here that you can use.